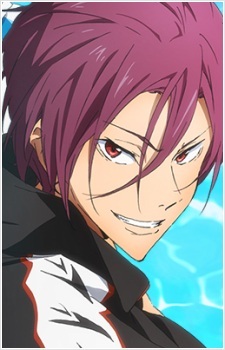 The rival swimmer from Samezuka Academy. Rin goes to all-boys boarding school. While he may not look like a loving brother, he cares for Gou, and is very protective of his sister. In the drama CD, he asked Captain Mikoshiba not to call Gou by her first name, declaring that he'll never give him permission to do so. Despite not being present when Captain Mikoshiba asked Gou out on a date (in which Gou turned him down), he felt like punching Mikoshiba after he has done so, and was wondering why he suddenly felt like that. He is strongly opposed to the idea of Gou dating any males, getting extremely worried and uncharacteristically worked up when he thought that Gou was on a date with a guy every week (or preparing a present for a guy), and he ended up stalking her on one of her 'dates' (although only after promptings from Nitori). Even though it turned out that Gou was buying Rin a present with the help of one of her friends. Rin's father died due to the rough ocean current thus drowning. His father was never able to accomplish his dream on becoming an Olympic swimmer, so Rin went to Australia in hoping to achieve the dream his father couldn't. Despite showing his aggressive behavior toward Haruka, Makoto, and Nagisa, it is hinted he still wishes to be a part of them.